Capture Attention: Establish credibility and rapport by sharing insight regarding the customer’s business, industry, company, or customers. Senior executives are motivated to meet with external thought leaders to gain objective market insight, which they cannot always get from the people who report to them. Earn the right to talk about your company as it relates to the customer’s business. For example, if you are speaking with a CIO, share emerging trends in IT that could enable him or her to significantly advance the company’s growth objectives. Engage Critical Business Issues: Confirm your understanding of the issues most critical to the customer’s business success. Work to build a deeper understanding, along with new insights into the customer’s world, in order to strengthen the solution that you are selling. It is powerful when you can formulate a solution or even the basis for a solution in real time during one of these executive meetings. Test the Value of Your Solution: Having formed a solution or, again, even a framework for a solution, experiment with your questions to determine how to most clearly articulate the value that you will provide. Make certain that there is a direct or indirect connection to the customer’s priorities. Secure Sponsorship: An executive will endorse your solution if the business value you say you can provide is both relevant and credible. But also take time in the meeting, or at a more informal moment, to understand what is personally driving the executive. That is, how a successful solution will affect him or her within the company. Perhaps it could lead to a promotion or strengthen a relationship with a key executive or better justify an increase in the department’s budget allocation. Confirm a Return Ticket: Before you conclude the meeting, agree on how you will report back to the executive. Suggest that you will close the loop with him or her only at significant points in the process. You don’t need to send the executive an email informing him that you’ve set a meeting with someone he recommended. Instead, report back after you have met with the other person on, for example, the magnitude of the financial impact your solution could have on their business. That is a noteworthy matter that warrants touching base with the executive. 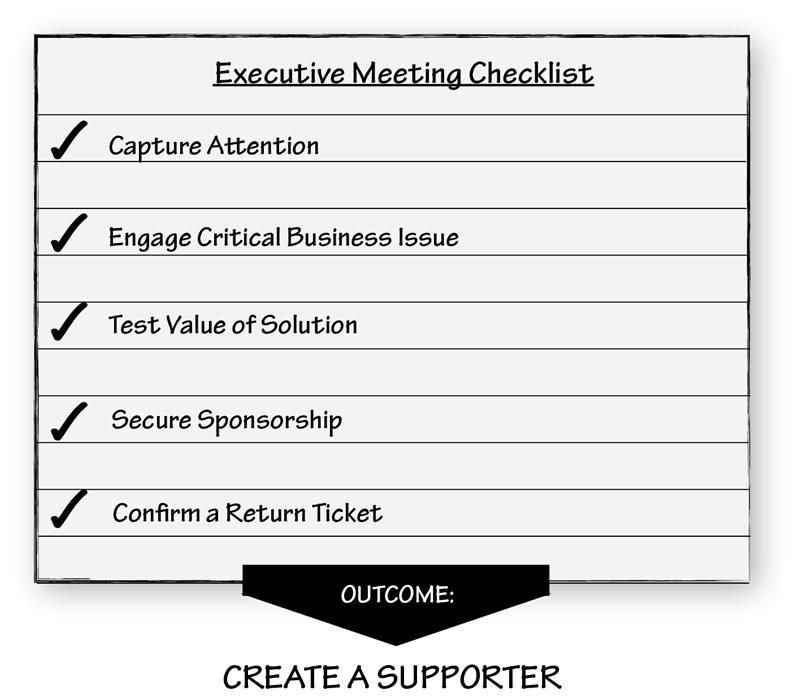 The process or Executive Meeting Checklist for conducting an executive meeting is a type of model. Another model would focus on how to prepare for such a meeting. As you can see, something becomes a management science when all the right factors can be modeled. This drives understanding, measurability, directional predictability, and most importantly, manageability. The result is to increase sales proficiency, along with scalability within an organization. In our view, the reason so many sellers do not do well in setting up and conducting executive meetings is that they are missing key models. And when selling is viewed as an art, no one looks for these models. But when selling is viewed as a management science their absence becomes readily apparent. Learn more about this topic in our book, The New Power Base Selling, which is now available for pre-order from your favorite bookseller. Download Chapter 1 here.